President of the Guyana Teachers’ Union Mark Lyte addressing teachers at the Enmore Community Centre. As teachers prepare to strike over deadlocked wage talks they are determined that government should know that their complaints are not just about money but about a continued lack of respect manifested in poor remuneration and abysmal working conditions. 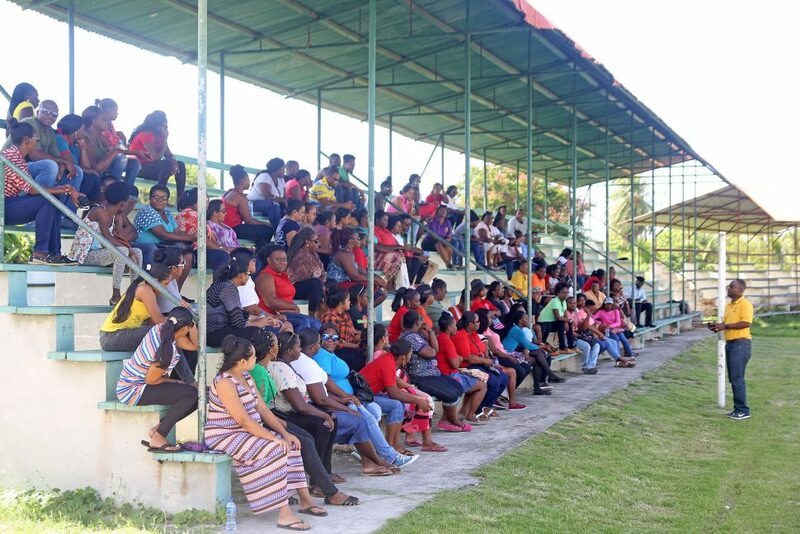 In fact, an announcement by the Guyana Teachers Union (GTU) that they cannot afford strike relief has not daunted the hundreds of teachers who yesterday showed up at the GTU headquarters and Enmore community ground to hear the details of the proposed strike action. GTU President Mark Lyte informed teachers during a closed door meeting that while the union cannot afford to provide cash relief to the more than 7,000 registered members they are in a position to offer foodstuff and other items to the most severely affected. 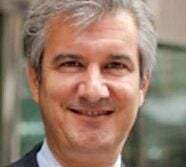 He also noted that the union will be seeking legal advice as to whether they can apply for an injunction preventing the Ministry of Education from withholding the salaries of striking teachers. He however stressed that he did not hold much hope that this would prove to be the case. The teachers however maintain that they don’t care. Several teachers have told Stabroek News that even without strike relief they are ready to strike. “This strike is long overdue. We accustom to banding we belly and we’ll do it for as long as it takes,” one teacher stressed. At each of the two meetings the teachers voiced their frustration not just with their conditions but with the response Government has given to their request. “Why must teachers have to live all their lives hand to mouth…I trying to access a loan and the big fancy manager look at my pay slip and say you can’t pay a mortgage with this. The Minister is talking about pay increase being related to performance well I get a 91.96% pass rate let her pay me. Let her pay me,” GTU First Vice President, Leslyn Collins demanded. Executive member of the South Georgetown Branch Stacy Benjamin further demanded that the Minister stop attempting to make decisions without understanding the issues. “Step out of that office and meet teachers and understand what we are going through. If you can’t come to the grassroots you will never be a proper Minister of Education,” an incensed Benjamin declared. Similar sentiments were raised by members of the East Coast Branch when they met at the Enmore Community ground. “We need government to be reasonable. You have teachers working at night at Qualfon and during the day in school. That can never be fair…stop looking at the percentage look at the reality of our cost of living…look at our working conditions,” Graduate Senior Mistress Renita Dindyal told Stabroek News. The heavily pregnant Dindyal lamented to this newspaper that her expenses far exceed 80% of her salary though she is a trained graduate with more than 10 years of experience. She also drew attention to the conditions under which she is working at the Annandale Secondary School and criticized the Ministry of Education for focusing on non-essential issues. “Why you going off on a tangent about ICT hubs when I’m boiling in blackout under a low zinc roof trying to teach 40 children? How you building schools with one toilet for 40 plus staff and there isn’t water to flush it,” she asked. Another teacher who spoke with Stabroek News was Randy Mingo, a Trained Graduate Teacher with 20 years of experience, who has recorded a 100% pass rate in his subject over the last three years. According to the current schedule of salary of the Teaching Service, Mingo’s gross monthly salary is $141,837. He told Stabroek News that after taxes and other deductions he takes home to his wife and two children approximately $120,000 (US$600). “This entire situation has made me very angry. I have two children, have to repay the University, paying a rent of $30,000 a month, electricity bill of around $10,000, Telephone costs of approximately $3,000 and transportation for my children alone is $8,000 and we haven’t eaten yet,” Mingo stressed adding that even with the salary his wife earns as a social worker there is very little the family can do outside of just existing. We are living pay cheque to pay cheque, he said adding that as a teacher you have to put in years of study in order to remain competitive and yet you can’t earn a living wage. Strike action begins on August 27 and the GTU is set to have a series of engagements across the country. Today a meeting is set for Linden while on Wednesday the union will meet in Bartica. On the Essequibo Coast on Thursday and in West and East Berbice on Friday.